Fine art, i-doc and virtual exhibition: bringing together a new frame of mind. As we are encountering the next generation of documentary film-making specifically designed for the web, interactive documentaries or i-docs, are making the experience of film watching online a richer and more rewarding experience than ever before, so is there a place for merging fine art, filmmaking and exhibition in an interactive online gallery? My area of enquiry is how the narrative experience enhances the way we conceive and interact with traditional forms of fine art and documentary storytelling in a digital space. Currently I am producing an arts documentary, a biographical portrait on accomplished Jordanian-Lebanese artist Rafik Majzoub. The project is a pilot interactive gallery that aims to merge traditional arts and film-making into a digital narrative. My aim is to publish a series of well-crafted short stories addressing personal, social and historical themes, whereby, allowing our audience to delve deeper into the artwork and participate in bearing witness to the human condition through Majzoub’s audio-visual narrative. My objective is to explore how to engage with new audiences in new ways with traditional forms of art, exhibition, and documentary production; to create an interactive space that promotes accomplished artists who seek through their work to penetrate our hearts and minds, awakens empathy, challenges status quo, and instigate change. This relatively new interactive experience I am tapping into is brought to us by pioneering digital organizations that are making your computer and the Web the new frontier of film-making. By no means are they attempting to replace long-format linear storytelling but to co-exist cohesively for a deeper immersive experience between the audience and the subject. My i-doc titled Rafik Majzoub: Memoirs of a Screw will be crafted into an online gallery space, which to achieve requires working outside regular web formatting, but made possible by adapting open source software HTML5, a Web-native video platform, with multimedia software such as Mozilla Popcorn (further discussion on technology will soon follow). Innovative i-doc labs I am drawing on are taking shape across the globe and The Living Docs website serves as the main hub for such collaborations. These labs are shaping the landscape and possibilities for filmmakers, digital designers, coders, and audiences alike to build interdependence in the online storytelling experience. Two crafty examples that demonstrate the possibilities in merging fine art, film-making and virtual exhibition are Guernika, pintura de guerra, (CCRTVi 2007) translatable as “Guernika, war paint” and Gallery of Lost Art (Tate 2012). Pertinent to these similar interactive experiences is the non-linear narrative design to stimulate a walk though the online ‘exhibition’ space to gain new perspectives on the artist and the artifact. But the two experience are very different in handling subject matter: one being about an existing Picasso masterpiece, the other, an art collective by highly accomplished artist that no longer exist, however, are brought to life again. Both examples defy the boundaries of the canvas and deliver a richer experience, through intimate testimonies from its creator(s), influential persons, art historians, theorists, and social media responses in ‘one click’ environment. Archival images, films, interviews, and essays are laid out for visitors to examine, revealing the evidence relating to the artworks. In the case of “Guernica, pintura de guerra”, alongside the production of the traditional documentary by program producers “30 minutes” of TV3, digital counterparts CCRTVi developed three interactive documentaries that users could watch on three different platforms: web, digital terrestrial television (DTT) and Media Center. 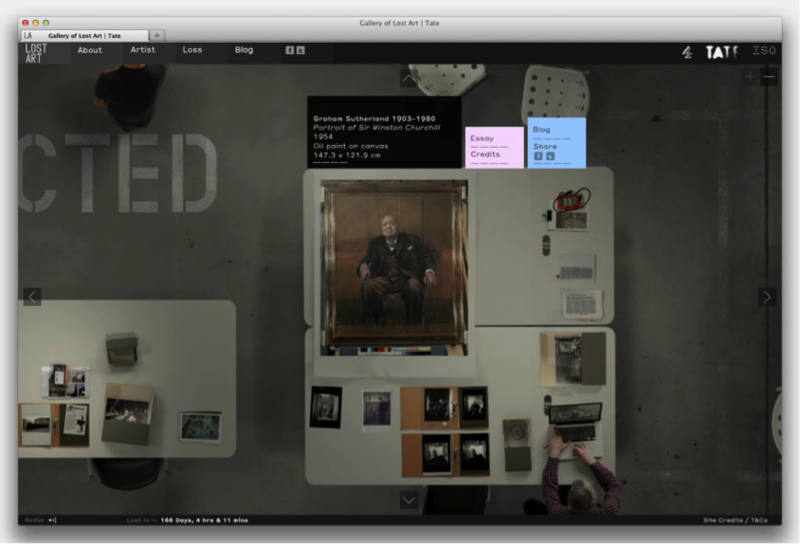 The contents of the documentary explore the interactive format and allow the viewer to extend their experience beyond the conventional documentary. The three applications provide information about the history and travel of “Guernica,” an iconographic analysis, composition and conservation of the painting, and biographies of people who have maintained a close relationship with this Picasso masterpiece. This allowed viewers to access, in an interactive way, a large amount of information: analysis of the picture, documents, interviews, biographies, games and more. Jane Burton, Head of Content and Creative Director, Tate Media, says: ‘The Gallery of Lost Art is a ghost museum, a place of shadows and traces. It could only ever exist virtually. The challenge was to come up with a way of showcasing these artworks and telling their stories, when, in many cases, poor-quality images are all we have left of them. 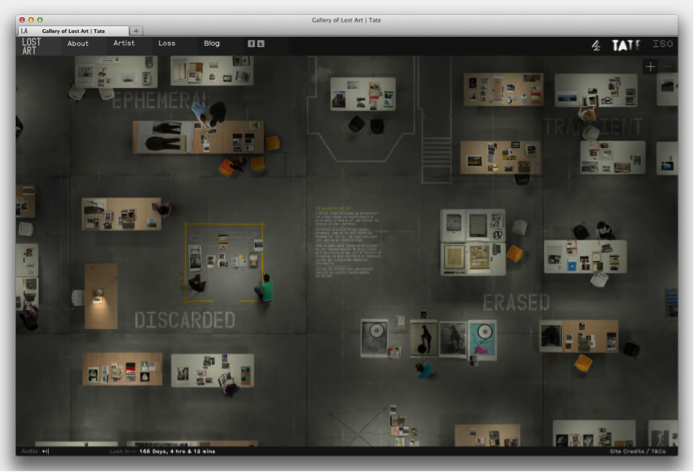 The result is a new way of looking at art: an immersive website in the form of a vast warehouse, where visitors can explore the evidence laid out for them. Soundscapes and documentary films add to the rich content experience. The cleaver twist to the Gallery of Lost Art is that the site was only live for exactly one year, and like the artworks within, were destroyed and lost forever. Drawing on these two case-studies the philosophy of art is now arguably much more translatable online for larger audiences than ever before, and the underlying innovations which made immersive experiences possible are continuing to influence major museum and gallery websites around the globe. We cannot ignore that there’s been a jibe in the art world for a while now that fine art hasn’t found a way to reach beyond the small and insular clique of curators and handful of collectors and loyal followers, but I do believe this attitude is about to change with digital storytelling and arts world colliding, bringing new opportunities to connect, participate, exchange information in a new pattern, making you laugh or sigh or simply look in awe. Such innovative virtual exhibitions will not only bring us closer and deeper into the arts world, but hand-in-hand, give us better user interface and user experience. Encouraging viewer statistics for Gallery of Lost Art indicate wider audiences are exposed to interactive narratives and want to interface with art in new kinds of ways.